Okay, here we go on the next project. With the assistance of Mike and Steve at S&W Engineering I am about to embark on the preparation of a 100" Landrover based coil sprung trialer. I intend to make it competitive but not spend a fortune. I have many ideas for it which will be achievable before the clubs start the majority of their trials. Pictures and blog will be added. I will try to see what media I can add which people will find entertaining. 7th April 2010 Just got back from 6 weeks work away and I now need to get a move on. 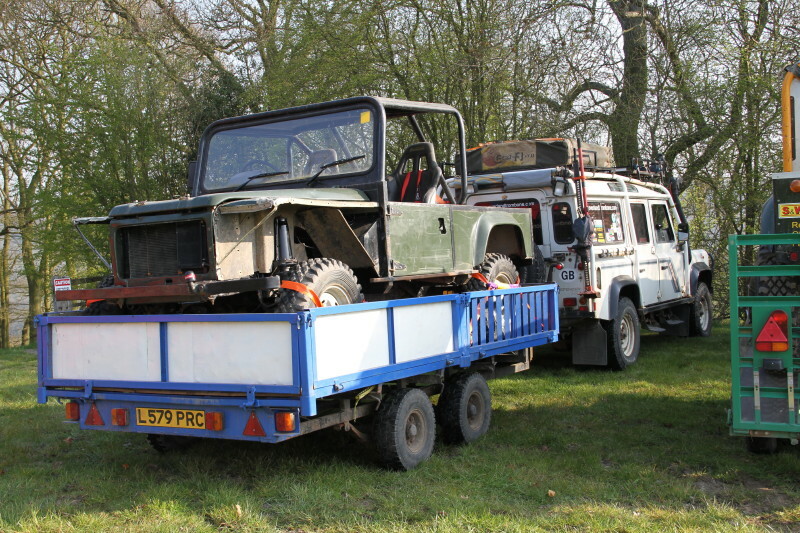 I purchased a trailer to carry the trialer but this has needed some work and is now almost ready to try out. I needed some ramps and we came up with the idea of trying to make them out of 2 of the existing side pieces. This gave me my first opportunity to weld as I added angle iron ladder rungs to the rectangular frame. I also had to rewire the electrics and fabricate mounting points for the lights. It is now in far better shape than when it started and today I hope to see if the ramps work. Fingers crossed. Work on the 100" so far includes changing plugs, rotor arm and replacing the plug leads with some really good ones. The air filter has been cleaned and re-oiled. The downpipe on the left bank has been tightened up. I have installed a new battery and added a marine cover over the fuel filler cap. The wings are mainly off ready to be replaced by a tubular wing arrangement which seemed the way to go as the existing wings had been destroyed. There are numerous jobs to do so I'll be off now and make a start. 9th April 2010 Big day today as I replace the fuel pipe, prepare the rear cross member and have Steve weld it up. The lads have taken 2 loads of scrap to be weighed in today and I am now in a position for the trialer to go on the trailer. Will the ramps work? Yes they do and Mike reverses the vehicle up onto the trailer. It fits perfectly and now we will have to see how it travels. 12th April 2010 Changed the fuse box, fitted fire extinguisher, fitted some more missing nuts and tightened up loose sump bolts, which at first glance, has stopped the drip of oil. More work has gone on fitting lashing eyes to the trailer and putting temporary stays on the wing tops. I took the vehicle to Broseley Wood winch event to use as a marshall. It worked quite well but the need for power steering is highlighted. Onto the list it goes!